The Permanent Resident and citizenship status are coveted by many professionals and investors who have been working in Singapore and want to stay in the city-state for a longer period. 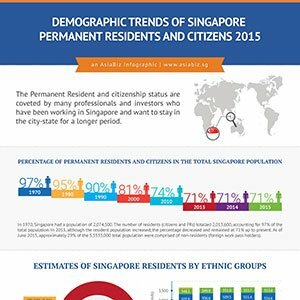 In this infographic, we present the demographic trends of Singapore PRs and Citizens 2015 and factors that affect your PR application. Join thousands of individuals who have enjoyed our reliable guidance and high success rate. Engage our immigration specialists and secure your Permanent Residence status with us today.